Your aura is the non-physical part of your being, depicted visually as a pattern of colours around and within your physical body. Aura colours are created by chakras. Chakras are energy centres in the aura. 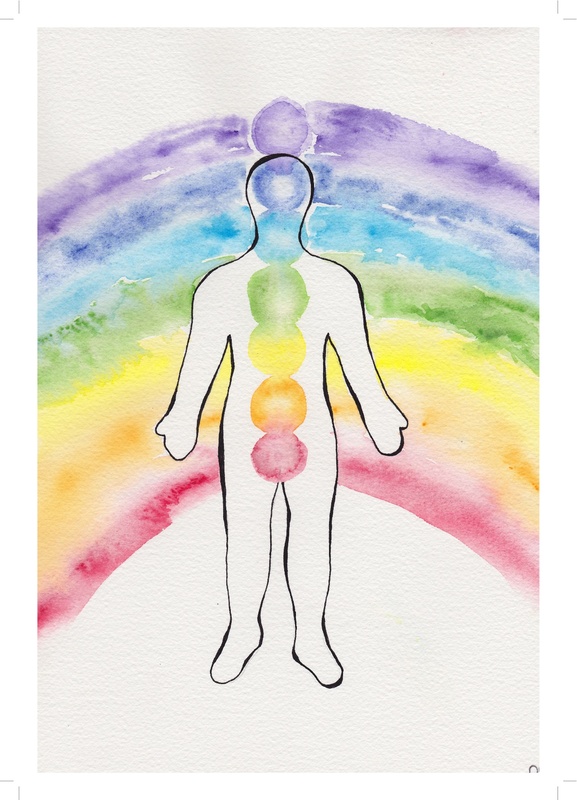 Each chakra generates a specific colour, as per Om’s watercolour paintings. 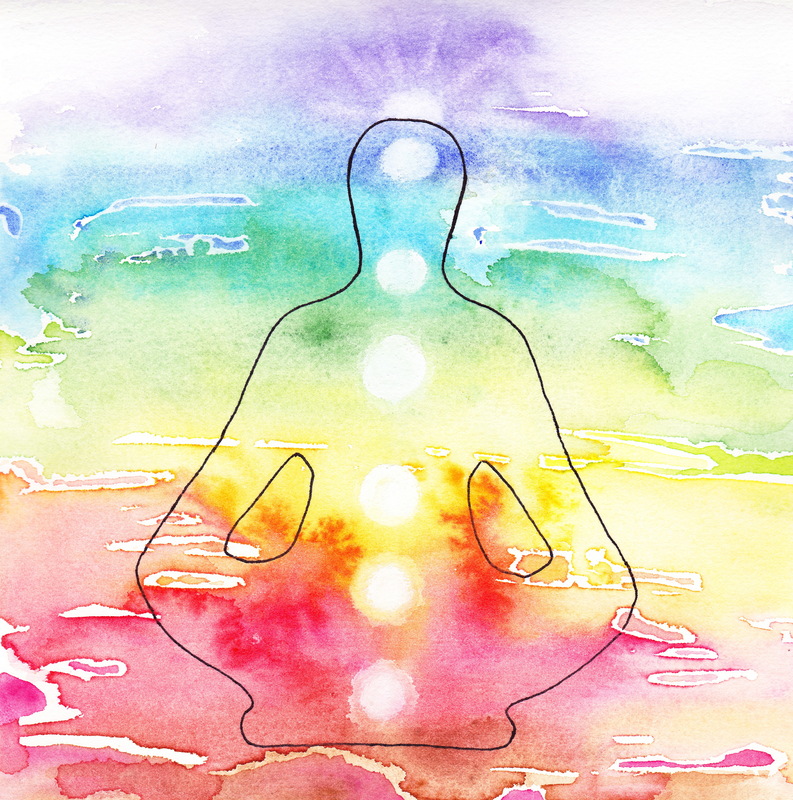 The aura is also a fantastic visual metaphor for the mind-body. For example, a blue aura is a useful visual metaphor for a very calm and peaceful mind-body state, whereas a red aura makes a great visual metaphor for a highly energised and passionate state of being. Aura colours found around the head area represent your perspectives, attitudes, thinking style and ‘what is on your mind’, especially your current or habitual thoughts. You could also think of this area as representing your eyes and how they see the world around you, almost as though each aura colour is colouring your view of reality. Hi Omanisa! So lovely to hear from you. It’s going okay. I like to ask others what colours they’re seeing to see if we are seeing the same. It’s amazing really because we quite often are a lot of the time. I absolutely love colour. At the moment my favourite colour is sky blue – not sure why just really like it. What is your favourite colour at the minute? I will definitely check out your page (and bookmark it). Again, lovely to hear from you – was a nice surprise. Rob. Hello Coffee Shop Psychic… I was doing a site revamp and came across this reply from you almost a year later. I think I had better check my notifications are working!!! I hope you can roll with me, trust the perfect timing and accept a heart-felt apology. I love sky blue- for me it’s a freedom, wide open-space, emotional equilibrium kind of colour. I think for me at the moment, my favourite colour on a more immediate basis is a rich, deep pink, one I call Wholehearted Pink. But my long term favourites are eucalypt-green (what I call Hermit Green), Silver and and yellow-brown ochre colour I think of as the Resourcefulness colour. And now I am very carefully ticking a wee little button I can see down there that says “Notify me of new comments via email” and crossing my fingers for a reply. Rainbow blessings! Hello! Do you mean books that teach you how to read the aura? You could try finding some of Judith Collins books, not sure if they are still in print. Or my Aura Colour Therapy book which has a section on using psychic perception to read the aura. So much of it is just about developing a language of colour and refining your psychic perception skills. A good understanding of the chakra system helps a lot. The positions meanings I’ve developed for the different body areas are loosely based on the chakra positions, but also just come from what my guides taught me and years of experience. Again, like the language of colour, it tends to be personal or subjective… so it’s just a matter of deciding what each area means for you.